Our Lady of Victory Basilica accepts contributions for the support of the Basilica and Our Lady of Victory Parish. Parishioners support the Basilica through weekly offertory contributions. Some make this through a parish envelope and parish envelope system. Others make contributions quarterly, semi-annually or annually. 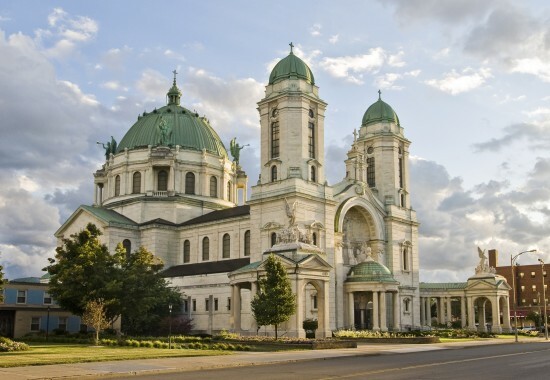 Our Lady of Victory National Shrine and Basilica is in the process of concluding a $2,000,000.00 Capital Campaign for needed renovations to the Basilica and other church properties. Contributions for this Capital Campaign can be sent to the address given above. Memorial contributions and other commemorative contributions can be discussed with Monsignor Paul Burkard, Pastor. The Our Lady of Victory Memorial Garden of the Sacred Heart makes available bricks, pavers and other locations for permanent inscription. Inquiries about this Memorial Garden can be made by calling the Rectory at 716-828-9444. For a brochure is describing this Memorial Garden please click here.